Following publication of our article  it was noted that Figures five E and five G were the same as Figures six A and six B. Figure 1 in this correction article is the correct version of Figure six that should have been included in the original article . We apologize for any inconvenience caused by this error. RT-PCR and Western blot analysis of NFκB. 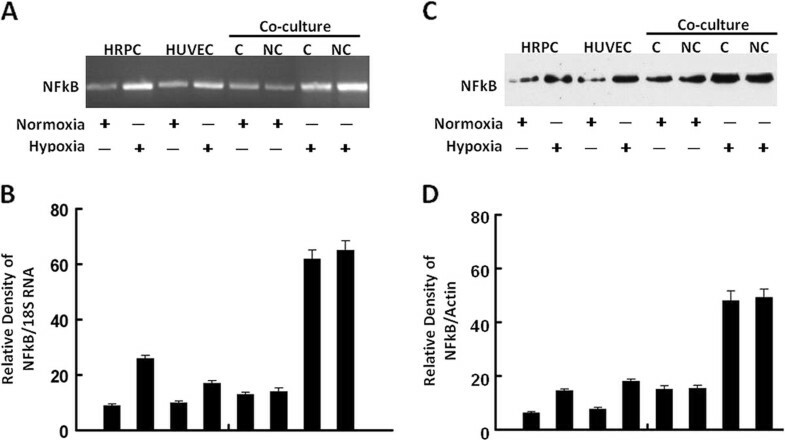 Total RNA and total protein were extracted from HRPC and HUVEC cultured alone or co-cultured under normoxia and hypoxia conditioned for 24 h. The expression of NFκB was measured by (A) electrophoresis of RT-PCR, (C) Western blot analysis in the HRPC and HUVEC. Figures (B, D) the band intensities corresponding to the NFκB were quantified by image analysis using a Bio-Rad scanning densitometer and Quantity One analysis software. Data were shown as ratio of NFκB densities to that of 18S RNA for RT-PCR and β-actin antibody was used to normalize Western blot for differences in loading and the transfer efficiencies. All data were expressed as mean +/- SE and results are representatives of three independent experiments.